Summer is coming and we can finally feel it in the air. Lazy, sunny afternoon (at least here in London) calls for a nice dessert. This creamy and fruity cake is absolutely perfect. It reminds me panna cotta a little bit but its more creamy and the fruits inside make a big difference. I find it quite difficult to stop on one piece…. · Line a 22 diameter springform tin with baking paper. You will need to cut a circle for the base and a long, 15cm wide strip of paper that you will use to line the side of the tin. · In a big bowl mix yogurt with splenda. · Dissolve gelatine in ¼ cup of hot water. Add 4 tbsp. of yogurt mixture to gelatine and mix well until gelatine well dissolved. · Combine gelatine mixture with yogurt. · Whip the cream and add gently to yogurt mixture. 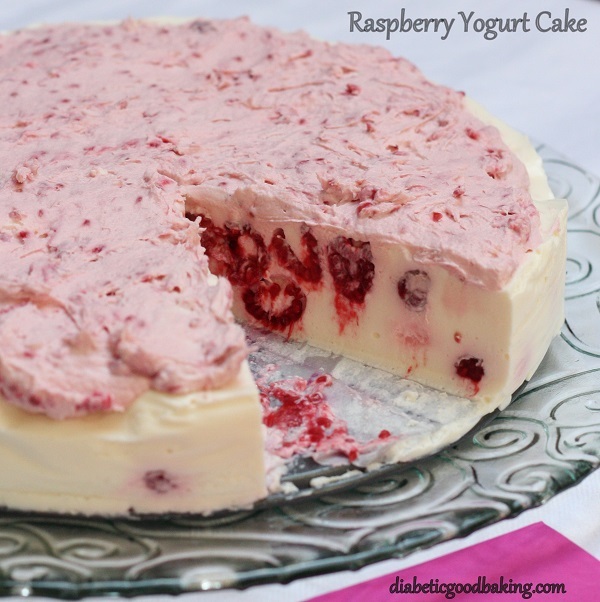 · Add frozen raspberries (put aside 2 tbsp. for the cream) and mix it all very gently. · Pour the mixture into the tin and refrigerate for at least 2 hours. · Mix mascarpone with raspberries and splenda. Spread the cream on the top of set cake. 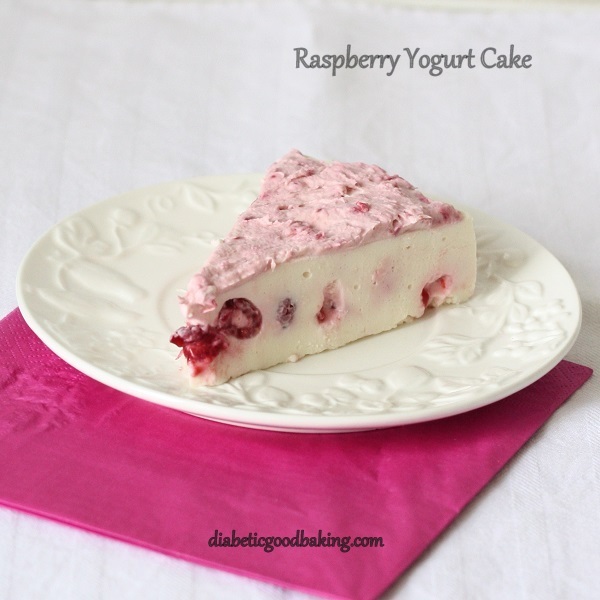 I love that this uses yogurt, plus raspberry. Sounds divine! Looks very delicious! And looks so beautiful with those berries! BUT any ideas on replacing gelatine for vegetarians? I wonder if Fruit pectin that is used to make freezer jam would work. Is Vegetarian. Im so sorry Stefanie your cake didn't work. How long did you keep it in the fridge? Did you put the right amount of gelatine? I put the cake in the fridge for couple of hours and it sets nicely (freezer is not a good idea I think). Thank you for your answer and your suggestions. I will have another try today and see if it works better. I used German Quark which I thought was very similar to Greek yogurt but maybe that was the mistake.